One bad cast. The blurry shape is in fact a real cast of a fossil. There is nothing wrong with your computer screen. Do not attempt to adjust your monitor. I won’t make the volume louder or quieter, because I have no idea how to do that. I want to change the focus to sharpen it to crystal clarity, but this image is in focus, it is the cast that is crap. For the next three minutes, sit comfortably and try to read on (if you want to). You are about to participate in a great adventure. You are about to experience the awe and mystery which reaches from the inner mind to – the really bad world of fossil plaster casts. And what an adventure. This is the first in a series of bad casts. And it is shockingly bad. The image is in focus, so it shows in all its beautifully terrible glory, just how bad the cast is. The makers didn’t even paint it to spruce it up a little. This cast could be a blurry centipede. It has segments and what appears to be long legs. The detail is very poor. Luckily, the old trusty old accession card reads Acidaspis buchii. 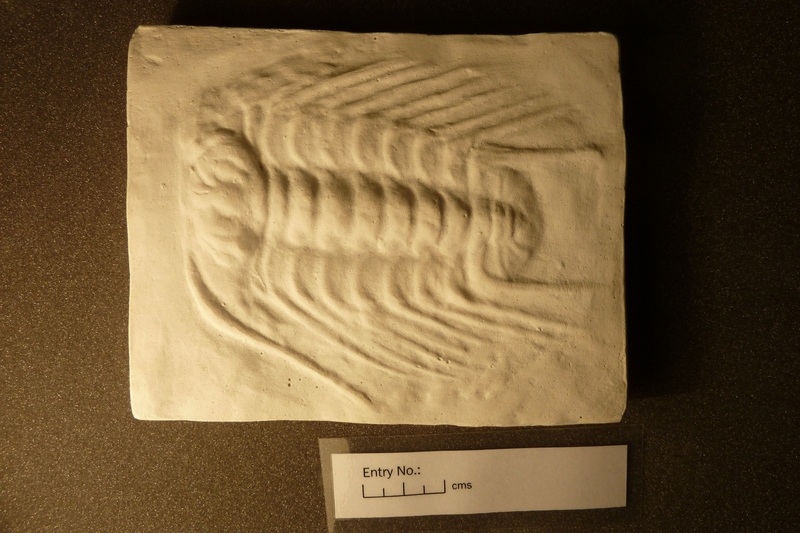 A quick Google – it’s a trilobite. Trilobites were a big group of arthropods (jointed animals) that lived from the Cambrian Period (around 520 million years ago) until the Permian Period (around 270 million years ago). Although incredibly successful animals, they only lived in the marine environment. To date there have been not fossils found in rocks from land environments. Trilobites get their names from their body shape – ‘three-lobed’. They have a head (cephalon), a body (thorax) and a tail (pygidium). With a hard segmented exoskeleton, some could roll up into balls, whilst other grew elaborate spines, for defence. Although you wouldn’t think so from this example, they are really quite cool creatures. Fossil remains of these extinct creatures show they were incredibly abundant during their 250 million year reign. These creatures evolved into hundreds of different species from as small as a 5 penny piece to bigger than a cat. Some were efficient swimmers, others browed deep in the mud. Some had eyes; deep sea ones didn’t. This ghost of a trilobite, Acidaspis buchii, is from the Ordovician Period (around 450 million years ago). It was quite a big trilobite filling my outstreched hand. What looked like long legs are likely to be spines growing out from the segments in the thorax. You may be able to make out two very faint, faded circles on the head. These are eyes. From this, I would say when this trilobite was alive, it was scurrying on the sea floor; spines on the side, and possibly top, were there to protect it from predators. It’s eyes suggest a shallow environment, where light could reach the sea floor letting the trilobite see. Is this a good cast? Not particularly. Would you take it home to show the old folks? Not on your nelly. You can barely make out any features of the animal. Without the old accession card, I could have believed it to be a centipede. It is a very bad cast. But there are worse to come. Much worse.